Stegomastodon: This artist's rendering shows what stegomastodons likely looked like.Courtesy Margret FlinschSo these young dudes at a bachelor party earlier this week in New Mexico suddenly discovered something really old. 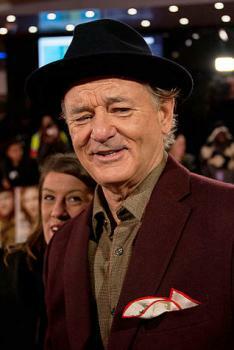 And it wasn't Bill Murray (who's been known to pop up unannounced at bachelor parties these days). Cavorting about the sand mounds of Elephant Butte Lake State Park, the guys found something odd sticking up a few inches above the surface. And of course they did what most young guys would do, they started digging. Stegomastodons were forerunners to the Ice Age mastodons and today's elephants. 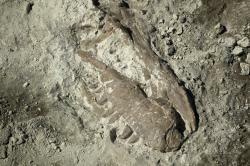 And according to paleontologists working on the project, the newly-discovered skull is one of the best skulls to be unearthed. Stegomastodons stood about nine feet tall and had curling tusks that extended up to 11 feet. Bill Murray, on the other hand, stands about six feet tall, has no protruding tusks and is believed to be somewhat younger than 3 million years old. We see headlines, newspaper articles, and television specials almost everyday—“Oil Spill in South America”, “Bird Species Endangered”, and “Temperatures At All Time High Due to Global Warming”. 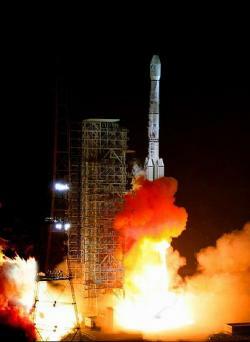 Environmental catastrophes and problems are undoubtedly a major world issue. While we are likely aware of some of the various environmental challenges global citizens face, preserving and restoring Earth’s delicate environment often leaves us with more questions than answers. Mahatma Gandhi once advised, “Be the change you wish to see in the world”. But progress is impossible if we do not understand or realize what those changes should be. After participating in an environmental outreach program between ‘Iolani School and Ala Wai Elementary, I’ve begun to see the importance of environmental education. Awareness is the first step towards action. Children especially, should be taught about their surroundings in order to become educated voters, innovative scientists, and productive members of an environmentally conscious society. Teaching children about anything, from the trees in their backyards to the earth’s atmosphere, can broaden their perspectives of organisms and the systems in which they operate. Although the saying is cliché, it is undoubtably true: children are the future. Ultimately, they are the ones who will propagate change and answer our questions. When we first started introducing ourselves to the students at Ala Wai Elementary, they seemed nervous and a bit confused about the purpose of the outreach project. One concept that we really wanted the students to understand was the connectivity of all living and non-living things, from animals and plants to water and weather. Although in the allotted time period it was impossible to go in depth about each subject, it was most important for the students to see the connection between the concepts. We also brought up ideas that the students were already familiar with and tried to get them to think about each in a new way. As the project continued, the students became more comfortable and seemed to gain at least some environmental insight. It filled me with joy to watch them playing with fish and looking through microscopes at things that they had never seen or paid attention to before. The most rewarding part of the project was bringing the Ala Wai surroundings, often taken for granted, to life. Showing students that experiments can be interesting and fun might encourage them to seek environmental learning opportunities in the future. My hope is that students realized that there is an endless amount of things to see and learn about in their world. In the process of trying to teach younger students, I myself became more aware of the importance of bringing the outside world into the classroom. Children need to put down their iPads and cell phones once in a while to understand and appreciate the world around them. In the future, they'll be thankful they did. Haley Harada is a high school senior at 'Iolani School. She wrote this blog post as part of a final project for AP Biology. 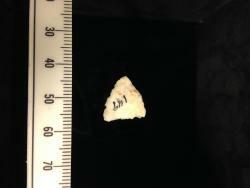 The most common lithic we found at Sheffield was Prairie Du Chien Chert, which makes sense because quarries can be found throughout the southeastern part of Minnesota. Another kind of lithic material we found was Tongue River Silica and this rock can be found on the western side of Minnesota. One stone that was particularly interesting to me though is Hixton Orthoquartzite since it is sparkly. 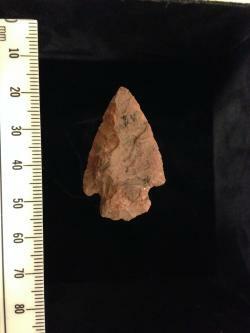 We believed the lithic material made of Hixton came from quarries in west Wisconsin. These are just three of the many lithic materials we found at Sheffield, these lithic materials are significant because of where they originate from. The Sheffield site is located along the Saint Croix River which acted as a means for transportation. Did the Oneota move from place to place and collected these rocks in their travels? 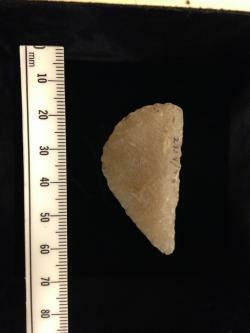 Lithics are an important part in archaeology and not just because the tools made from them look cool. The material that makes up the stone can have as much information as how the lithic material was made into a stone tool. We are not just looking at rocks, but the more we know about what types of material were being used the more we might know about the people who lived at Sheffield. 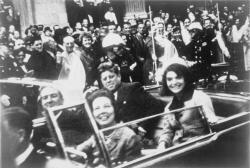 New science to old question: New science is helping answer questions on the assassination of John F. Kennedy.Courtesy Victor Hugo KingFifty years after the fateful day in Dallas, Texas, people are still working to find definitive answers to the details of the shooting of President John F. Kennedy. What if the current forensic investigation techniques would have been available then? That's a question the Discovery Channel recently posed in producing the show "JFK: Inside the Target Car." Here's a quick summary of things they learned through their experiments. Click here to get more details about how this all was done. The Dallas motorcade scene was recreated with modern-day, high tech dummies situated in a car. The dummies were made of materials that have similar properties to human flesh, bone and blood. Sharpshooters then shot the surrogates from the model depository, the grassy knoll, and four other plausible locations that are part of assassination theories. Two forensic experts, who had no knowledge that the situation was set up to recreate the shooting in Dallas, examined the evidence. Their finding was that shots came from above and behind the pathway of the car, a finding consistent with the location of the Texas Textbook Depository. Up-to-date science was also applied in making a 3-D animated simulation of the assassination scene based on angles of possible bullet paths, information from the Zapruder home movie of the motorcade, and also wind speeds and directions. Based on blood spatters created through those simulations, the origin of the fatal shots had to be from the textbook depository. Experts add that while modern science more accurately determine where the shots were fired from, they still cannot determine without doubt if Lee Harvey Oswald was the shooter. How do you feel about this new application of science to this dark moment of American history? Does it answer your questions on the assassination? Share your thoughts with other Science Buzz readers. Here's a link to the Discovery Channel's website for the show. Mystery MandibleCourtesy SMMIn an area called Kasota, a kid found a mysterious mandible in the riverbed. A mandible if you don't know is the lower jawbone of an animal. My friends and I all believed it to be a cow, elk, or a moose skull. 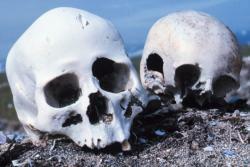 After researching and comparing it to other skulls we found out that it was indeed a cow skull. We went to the Science House in the Science Museum of Minnesota to compare our mandibles to the ones in their collection. When we compared it to the elk mandible, our mandible was the same length but it was obvious that bone between the teeth and the bottom of the mandible was narrower on the elk mandible. 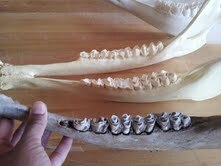 Our mandible was too big to be any deer mandible so we were certain it was not a deer mandible. 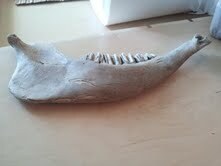 When we were comparing it to the moose our mandible seemed a little too small to be a moose mandible. When we compared it to the cow mandible it was almost a perfect match. So we concluded that it was the mandible of a cow. Science & law: The concept known as the Minnesota Protocol has helped lead to genocide convictions against a former leader of Guatemala.Courtesy Captain Budd Christman, NOAA CorpsHow does Minnesota factor into the recent judgment against political genocide actions in Guatemala? The findings that have brought justice in the case relied on "The Minnesota Protocol." The full report on how the protocol was used in Guatemala can be found in this article in the St. Paul Pioneer-Press. Work on the protocol started in Minnesota 30 years ago by a team of lawyers concerned with growing international strife. They created a format for neutral scientific third parties to investigate claims of assassination and genocide after it was becoming apparent that in many offending countries, those investigations were being done by groups sympathetic to the leaders being accused of the crimes. The concepts were adopted by the United Nations in 1989 as a global standard to use to investigate such situations. In the Guatemalan case, former military dictator Efrain Rios Montt was recently found guilty of ordering actions that claimed the lives of at least 1,700 indigenous people during the 17 months after he seized power in a military coup in 1982. A key pieces of evidence were found in a mass grave of 50 bodies found underneath a soccer field that were eventually examined by Forensic Anthropology Foundation of Guatemala using principles of the Minnesota Protocol. Similar investigations using the Minnesota Protocol have led to genocide convictions in other corners of the globe such as Rwanda and Bosnia. Wanna help with a Twin Cities urban heat island project? The Science Museum of Minnesota is a partner with the University of Minnesota on its Islands in the Sun project, which is monitoring the urban heat island in the Twin Cities to find ways of lessening its effects through landscape design. More than half the global population now lives in cities and so there is urgent need to understand and mitigate urban heat islands, especially during heat waves when the risk of heat-related illness and mortality can increase dramatically. 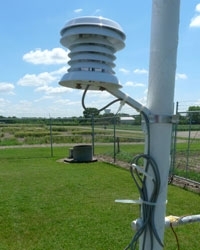 Islands in the Sun is setting up temperature sensors throughout the Twin Cities Metro Area. This temperature network when completed will be one of the densest in the world. Would you like to be a part of this effort? Islands in the Sun is especially interested in volunteers willing to have a sensor installed on their property and who live in the following locations -- downtown Minneapolis, downtown Saint Paul, Saint Paul – east of Rice St, West Saint Paul, South Saint Paul, Mendota Heights, Inver Grove Heights, Eagan, Oakdale, Woodbury, Cottage Grove, northern Roseville, Arden Hills, and Plymouth. Information about the sensor and its placement can be found here. If you are still interested after reviewing this information, then fill out and submit a volunteer form. Please note that your interest does not guarantee that a sensor will be installed because each site must meet certain criteria. If selected, a temperature sensor will be installed at a location on your property acceptable to you with the expectation that it will remain onsite collecting data for up to four years. 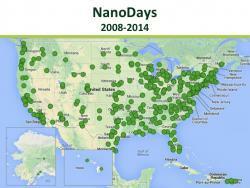 A technician will visit the sensor every two to three months to download data. Thanks for considering being a part of this ground-breaking research project.